With a large capacity at 4.4 cu. ft., this top load washing machine utilizes the PowerWash. agitator to stir up the concentrated cleaning and robust wash action needed to remove tough stains. This powerful washing machine also muscles in the Best Cleaning in its class driven by the PowerWash. cycle. Plus, the Quick Wash cycle helps clean loads faster by shortening cycle time. The Deep Water Wash option gets more water on wash cycles when you want it, for deep water wash clean. Add in the included 10-year limited parts warranty1 on the motor and stainless steel wash basket, and you've got the power to clean tough loads for the long haul. Better Built for Best Cleaning in its class driven by the PowerWash. cycle3,* this 4.9 cu. ft. I.E.C capacity top load washer tackles both stubborn stains and crusted-on messes. For more water when you want it, the Deep Water Wash option offers a maximum fill to help rinse away soils, while the PowerWash. agitator provides concentrated cleaning and robust wash action to remove tough stains. Plus, the Deep Rinse option on this high efficiency washer helps eliminate excess detergent and fabric softener to ensure the ultimate clean for every load. Add a 10-year limited parts warranty21** on the drive motor and wash basket, and you've got the power to clean tough loads for the long haul. 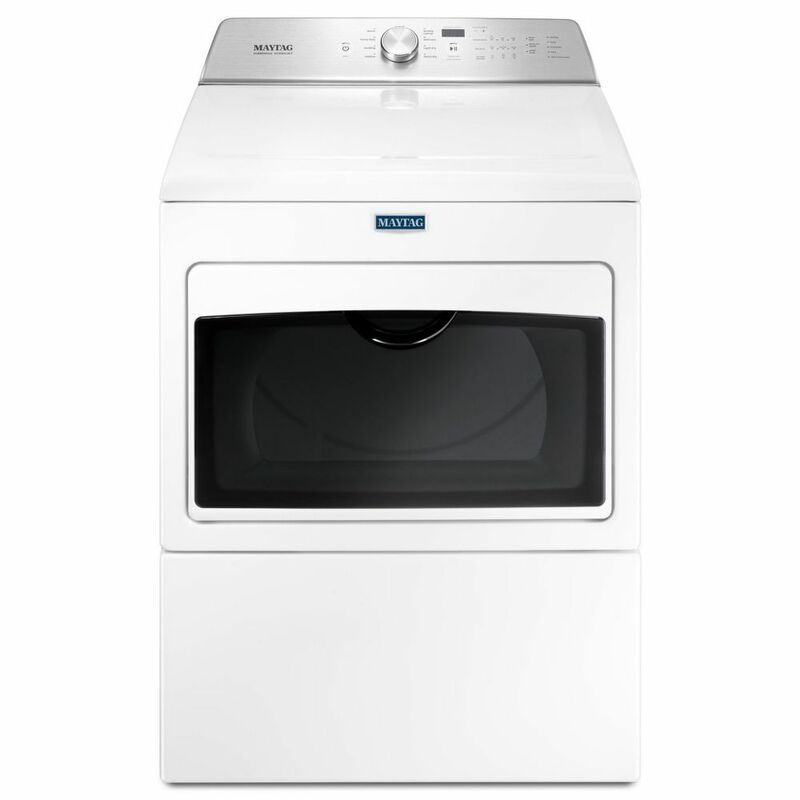 Maytag White, Large Capacity Gas Dryer with IntelliDry Sensor - 7.4 cu. Feet. is rated 3.8 out of 5 by 23. Rated 5 out of 5 by Nita from Love the extra room it has compared to my old... Love the extra room it has compared to my old Maytag! Still getting used to the different heat cycles! Rated 3 out of 5 by FredJohnson from We've owned this machine about a month now. It's a nice looking machine, with a classic appearing... We've owned this machine about a month now. It's a nice looking machine, with a classic appearing control panel that is actually a touch control panel. Unfortunately, Intellidry leaves clothes damp. You can boost the drying cycle somewhat by following the instructions in the operators manual, but the dry sensing feature still leaves the load a bit damp. I guess that's the "energy saving feature" in action. The saving grace of this machine is that you can use the Timed Dry cycle to force it to dry like an old school clothes dryer. The bottom line is we got this machine for its load capacity. The different programmed drying cycles are nearly useless to us as they are all linked to Intellidry. But like I mentioned before, the Timed Dry cycle makes this machine useful for us. Rated 2 out of 5 by Jeremy from Looks Nice Dryer worked fine for three or four cycles, then the control panel started failing to respond normally. Sometimes it won't power off or on, sometimes trying to change a setting sets in motion a bizarre sequence of flashing lights. It often won't start until you successfully complete an inscrutable series of unplugging/plugging in/pressing random buttons. It's extremely irritating to have to call for warranty work on a week old product. I suspect Maytag is the latest once-reputable company to continue using its good name to sell products at a premium while it races to the bottom. Rated 2 out of 5 by Lindsey from I’ve had dryer for weeks now uninstalled because no one... I’ve had dryer for weeks now uninstalled because no one sells the attachment to convert to LP gas. Why don’t the stores carry this? Quite ridiculous. Rated 5 out of 5 by Jeff from Our new dryer works great, looks great, so great... Our new dryer works great, looks great, so great in fact my wife gave them nicknames. We couldn’t be happier at this point of our ownership. We love them – washer and dryer both. Rated 5 out of 5 by JS from Easy to hook-up, just make sure gas flow is disabled before disconnecting/connecting and use gas ... Easy to hook-up, just make sure gas flow is disabled before disconnecting/connecting and use gas (yellow) teflon tape (5-6 wraps). After that enabled gas flow, check for leaks with dish detergent. No leaks!....I'm good to go. Love It, Work Great!!! Good Investment!!! Rated 5 out of 5 by Sandy from I love my new Maytag dryer purchased from HD @ great price. My laundry dries so much quicker. I love my new Maytag dryer purchased from HD @ great price. My laundry dries so much quicker.